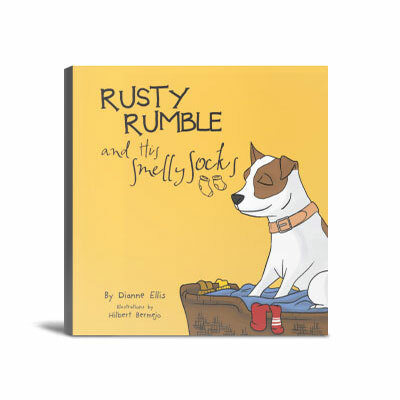 Rusty Rumble and His Smelly Socks captures the comical story of a dear little dog, Rusty, who waits anxiously in the dog shelter for someone to give him a good home. The Rumble family is on a drive one day when Summer sees the sign pointing to the Dog Pound and asks her father if she could look for a little spotty dog. Summer instantly falls in love with Rusty so they take him home and give him good food, walks, bubble baths and lots of love. Rusty is in heaven. But, on Monday morning when they all leave the house, he feels alone and sad and can’t wait for their return. That night, while contentedly lying by their sweet-smelling feet, Rusty has a great idea. So, he secretly collects a smelly sock from each family member and hides them in his little bed so he’ll never feel lonely again. Join Rusty and his family as they take a day trip to the beach. Experience the relaxing feel of the lovely sunny day and discover a myriad of wonderful activities that you will definitely love. Follow the adventures and misadventures of a feisty and inquisitive little dog who experiences a myriad of interesting creatures on land and in water. 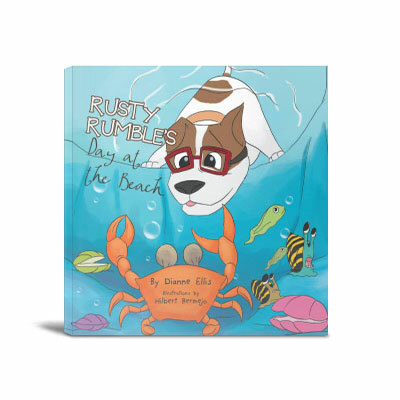 From a face-to-face encounter with a crab, to backing into a huge Labrador and saving his family from a shark attack, the surprises never seem to end in Rusty’s beach outing. How will the rest of the day turn out? Find out in Rusty Rumble’s Day at the Beach. 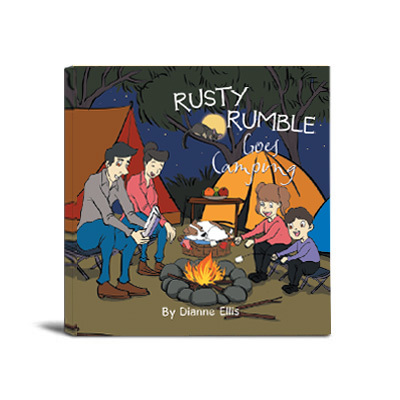 As a loved member of the Rumble family, Rusty joins his family for a camping weekend. The Australian bush is full of new and wondrous smells and Rusty’s curiosity soon lands him in trouble. Rusty is fascinated by his new surroundings but protecting his family is his first priority in life. In doing so, Rusty experiences close encounters with a number of bush animals such as a possum, echidna, snake, platypus, and a kangaroo, to name a few. This book shares many amusing adventures; however, the weekend proves to be very stressful and tiring for this vigilant little dog. Rusty enjoys his weekend away but feels much safer and happier at home with his loving family. 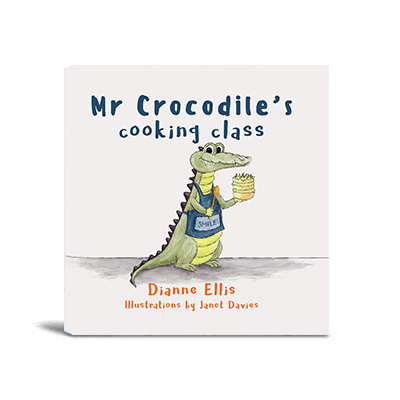 Mr Crocodile loves sponge cake and he's quite excited when Mrs Crocodile suggests he learns to cook. What a wonderful idea, he can make his own cake every day! But when he goes along to cooking classes he realises it is harder than he thinks. He burns his omelette, his scones sink, he fluffs his meringue... Mr Crocodile is ready to give up. But Mrs Crocodile encourages him to practise his cooking and before long, he wins Chef’s Award for the best seaweed sponge cake. Mr Crocodile continues to cook and even discovers new recipes. A delightful story of encouragement, perseverance and having belief in yourself. Suitable for children up to 7 years.